The United Nations recently announced a campaign to encourage young people to address climate change. Red, the leader of the Angry Birds mobile phone game, was made an Honorary Ambassador for Green at a launch event in New York. The campaign is designed to make a direct link between tackling climate change and people’s happiness and well-being on the occasion of the International Day of Happiness, observed on March 20. 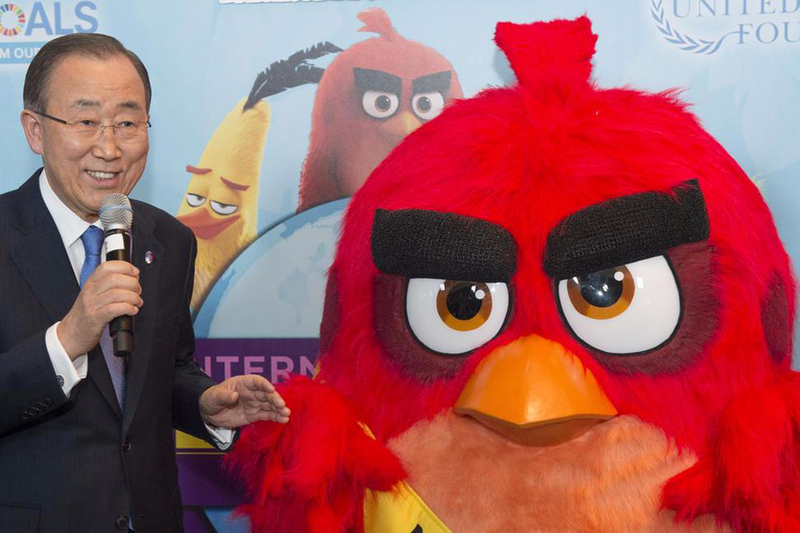 “The Angry Birds have entertained millions of people around the world – and now they are part of making the world a better place,” said Secretary-General Ban Ki-moon. “We are proud to give Red a reason to go Green. There is no better way to mark the International Day of Happiness than to have our animated ambassador raise awareness about the importance of addressing climate change to create a safer, more sustainable and happier future for all,” Mr. Ban said. The campaign, in partnership with Sony Pictures Entertainment, the UN Development Programme (UNDP) and UN Foundation, asks the general public to make the Angry Birds happy by taking actions on climate change and sharing their photos and commitments on social media using the hashtag #AngryBirdsHappyPlanet. As part of his ambassadorial duties, Red has started a “virtual world tour”, highlighting various ways to take climate action. The tour will take him to Paris and will end in New York, where world leaders will sign the Paris Agreement at the UN Headquarters on 22 April. The presentation included the movie’s stars Jason Sudeikis, Josh Gad and Maya Rudolph, who asked the attendees for their support to make the Angry Birds happy by doing their part to take action against climate change. By participating in the #AngryBirdsHappyPlanet campaign, individuals can make the Angry Birds happy and “Help Red Go Green” by posting photos and messages to show how they are protecting our planet by recycling, taking public transportation and conserving water, for example. By advancing progress towards the interlinked Sustainable Development Goals (SDGs), adopted by the UN General Assembly last September, “we can help spread happiness and secure peace,” he stressed. Since 2013, the UN has annually observed the Day on 20 March as a way to recognize the importance of happiness in the lives of people worldwide. This year’s focus is on the relationship between having a healthy planet and happiness.